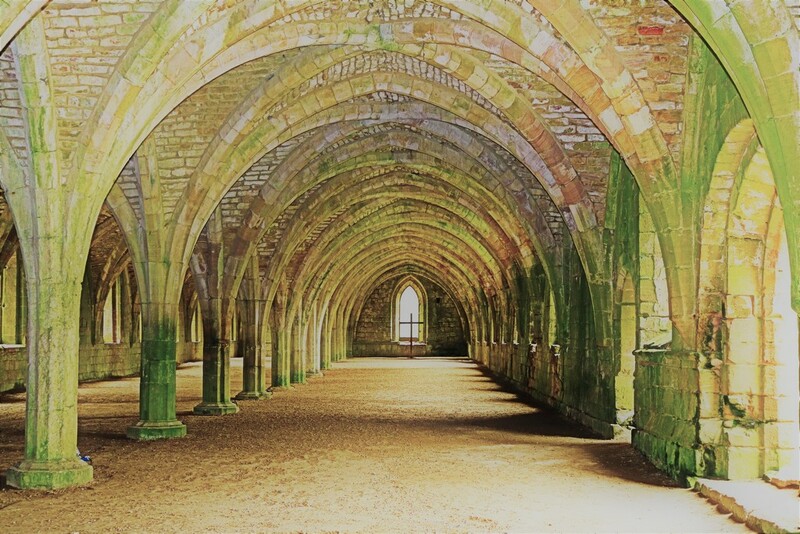 This is the cold cellar, or 'refrigerator,' at Fountains Abbey. A very large ground level stoneclad store area for the Abbey's food and drink supplies. Apparently it had a dedicated Abbot (with support staff) to maintain the resources. Naturally cold, as you can tell by the green tinges to the stone; considering when it was built, 1132, the art of the construction possibly couldn't be replicated today. Another filler, sorry; totally immersed in work this last few days with no end in sight. Nice capture. Love the lines. Wow - love the sense of depth. This is incredible. I can just imagine the wine cellar here, oh my! Fav! Definitely a fav. Love the PoV. I love the colors and light, such beauty. This is magnificent. Love all the repeating arches and textures. An impressive structure, with all those subtle colours. Lovely ! Interesting colour tones, shows the structural detail very well. Lovely shot - it's such a nice place to visit too!